Congrats! You just registered for Rookie Triathlon, the first triathlon of your life! Time to start training for the 300m swim. Purchasing swim equipment will help you improve in the water. Once you get all of your swim equipment, you probably have some questions about using it all. What’s a kickboard? Are you placing your buoy properly? What about your paddles? 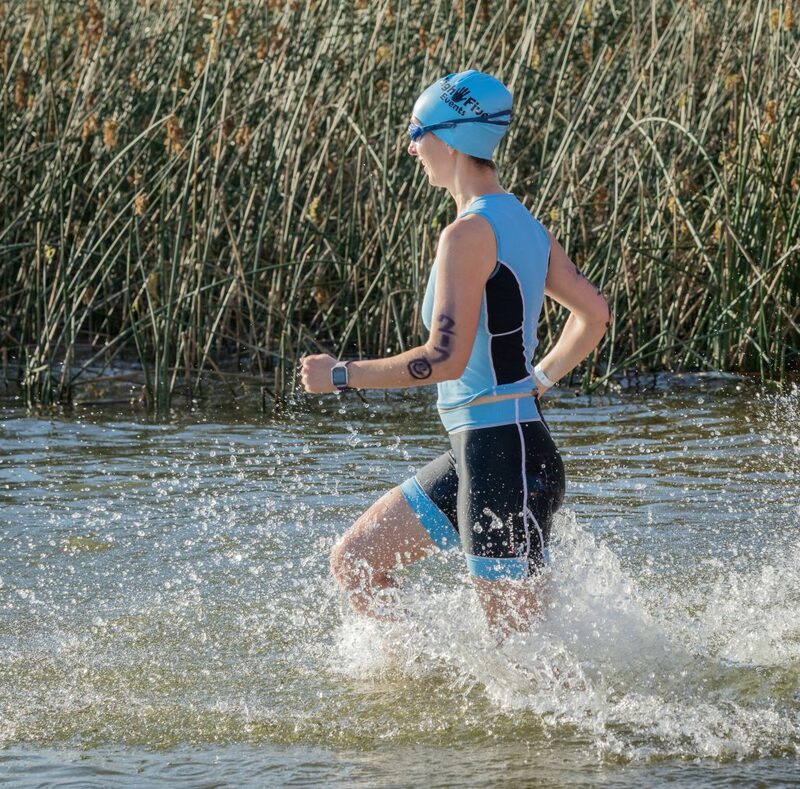 Here are some training tips that’ll help you get acclimated to your new swim equipment. We also provide some swim equipment recommendations! Paddles – Swim paddles should fit within 1-2 inches of space around the edge of your fingers for maximum pulling power. Make sure to enter the water with your hand at a slight angle when swimming with paddles to reduce resistance against the paddle. Buoy – Place the swim buoy between your thighs and try not to kick while you are pulling. The buoy will help stabilize your lower body. This allows you to rotate your hips and shoulders more effectively without the help of your kick. Pulling with just the buoy (no paddles) will help you focus on your “catch” in the water. Adding the paddles is a great way to increase your upper body strength. Fins – Fins should fit snugly around your foot, but not tight. When kicking with fins, make sure to keep your legs fairly straight and use your hips to kick (without too much bend in the knee). The fins should help propel you through the water while keeping your upper body relaxed. Fins also help with ankle flexibility, which is very important in swimming. Kickboard – The streamline kickboard helps beginner swimmers glide smoothly through the water as they develop the kick. Focus on keeping your lower body and the board on the surface of the water to reduce drag while you are kicking. Aim for small, quick kicks with your legs. Mesh bag – Putting your swim gear in a mesh bag will help prevent lost or misplaced equipment. It will also allow your equipment to dry quickly after swim workouts. https://therookietri.com/wp-content/uploads/2018/11/swimequipmentWPfeature.png 400 495 William Dyson http://therookietri.com/wp-content/uploads/2015/11/Rookie_Tri_Race_header_logo1.png William Dyson2018-11-28 19:11:002018-11-28 19:11:00New Swim Equipment, Now What?